The U-Bench work station, with model number OEUBS-100 with built-in collimators and FC receptacle connectors, can be used to build functional optical modules like polarizer, filter, wave plate, chopper etc. The U-Bench allows the user to access the laser beam and to add free space optical component for fiber optics applications. Different material samples can be placed on the platform between the two collimated beams to test the material absorption spectrum. To reduce the optical power loss in the U-Bench, two collimators aligned with each other are installed in the two ends of U-Bench. The two collimators are mounted on the tilt adjustable and lateral adjustable couplers (our proprietary technology) for easy adjustment and easy alignment after the new optical component is inserted in the U-Bench. THe Long U-Bench, with model number OEUBL-100, has a working distance of 135 mm between the two collimators. It was especially designed for gas cells, liquid material sample cylinder boxes and other biomedical applications. The V-Groove shape bottom plate provides a easy and simple centering position for gas cells and material sample boxes. 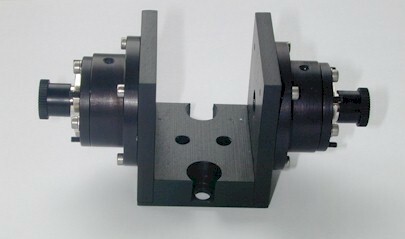 An input collimated beam is used to illuminate the sample material and an output collimator is used to collect the light from the tested material. Based on our advanced tilt and lateral adjustable collimator technology, the OEUBL-100 has very low insertion loss for different fiber types like single mode fiber, multimode fiber, and polarization maintaining fiber.